So, you have a 1999 to 2002 Chevy that does NOT have the plug on back. It "should" have the plug under the dash anyway, so you can plug right into to it. You will have to run some more wire, but lets look into it. Now, under the hood, is the main fuse box. You are gonna have to take the cover all the way off this one. On the chevy trucks I have done, you mist remove the corner fender brace from the fire wall to the fender. Two 13mm bolts on the firewall, and two on the fender. With the brace out of the way, you can take the main cover off the fuse panel (remove the top cover, and the main cover) The cover just snaps on, just pull the lower sides out, and it will come off. 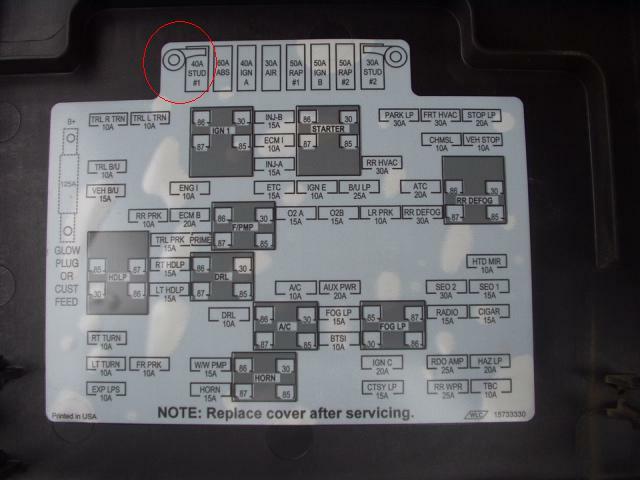 Once the cover is removed, you will see two studs, on the engine side of the fuse panel, that were covered up with the cover. Also, you should see a red wire with a eyelet on the end to slip over the stud. Put this on one of the studs (it is supposed to be the 8mm to the front of the truck) If you need a nut, it is 8 mm coarse metric thread. (the other stud is 10 mm Coarse metric thread). Now you will see the row of large fuses. At each end of this row, the last fuse powers the stud next to it. Put a 30 amp fuse in the empty slot next to the stud you used if it does not already have a fuse in it. This should supply power to your brake controller. 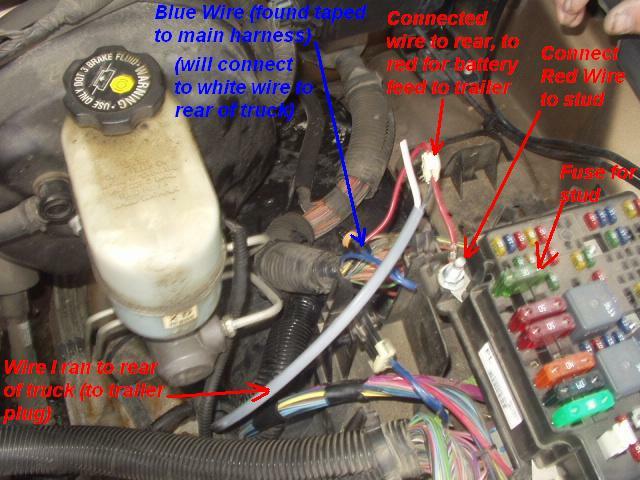 Next, locate the thicker dark blue wire taped back, it the area of the underhood fuse box. Normally it is just folded back, and taped to the wire harness, and may have a un-used plug on it. This is the brake wire FROM the brake contoller. If you see it, and it is not hooked to anything, your truck does not have the tow package, sorry. You will need to connect to this Dark blue wire to the trailer plug at the back of the truck. I also connect a wire from the red one you connected to the stud in the fuse panel, and run it back to the trailer plug too. This gives you the 12 volt supply many trailers need to run insude lights, or charge break away batteries on the trailer. I use two conducter, double jacketed 12 OR 14 Gauge wire. One wire connects to the blue wire you just located, and the other one connects to the same stud you connected that red wire to. Run this wire all the way to the back of the truck. Strap or tie it up out of the way, so it will not get cut or chafe on metal an short out. I usally zip strap it to the main wire harness that runs along the frame. 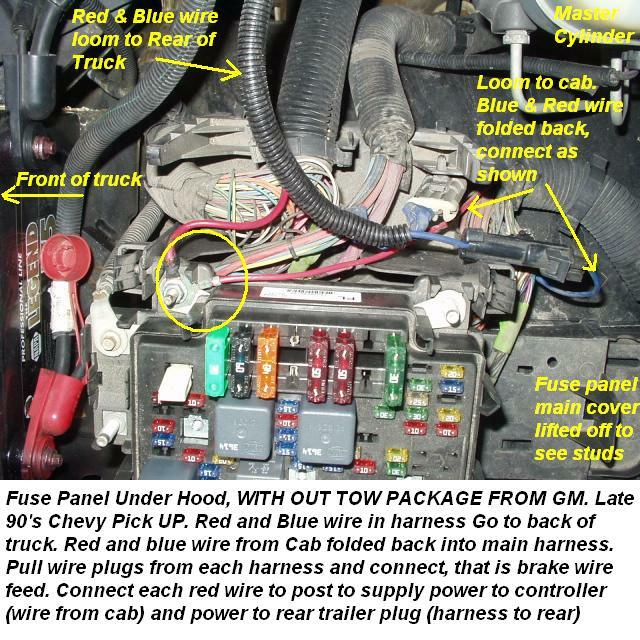 At the back of the truck, the blue wire (or the wire you hooked to the blue wire up front) connects to the "blue" terminal on the plug, and the red wire connects to the "black" terminal on a standard 7 way plug. 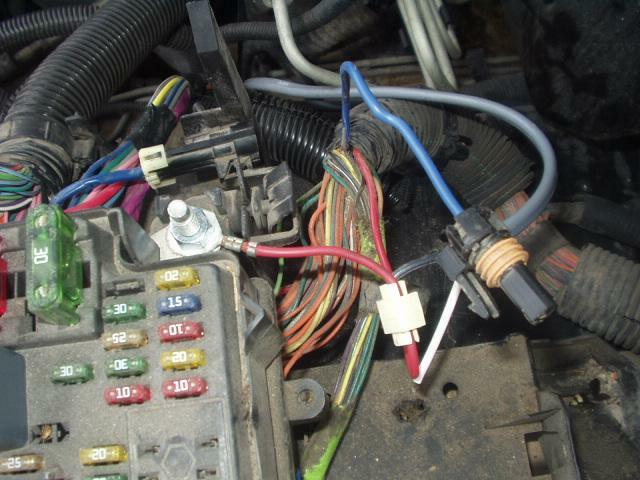 The trailer lights are already at the back of the truck, use your owners manual for wire colors. I THINK they will be Yellow is left stop, Green is right stop, Brown is parking lights, light blue is the high mount stop light. (check you manual to be sure!) Plug terminals are labeled as follows: Red, left turn/stop. Brown- right turn/stop, Green- running lights. Dont hook up the high mount brake light. Here is apicture of a Late 90 early 2000's truck that did not have the tow package but chevy DI include the wires, they just did not hook them up! Look under your hood for these wires! One quick note, I am working on a few pictures of the early 1998 and older trucks, that have NO plug. I have found that on many of the older truck, they do have a "panel" on the firewall under the dash, sort of behind the park brake. Normally grey plactic. I have located on A FEW of the trucks, a brake light source. It was the two pin hole marked "TAN" ALong the bottom if I remember, and it was the right pin. Check it with you test light, should light up when you hit the brakes. 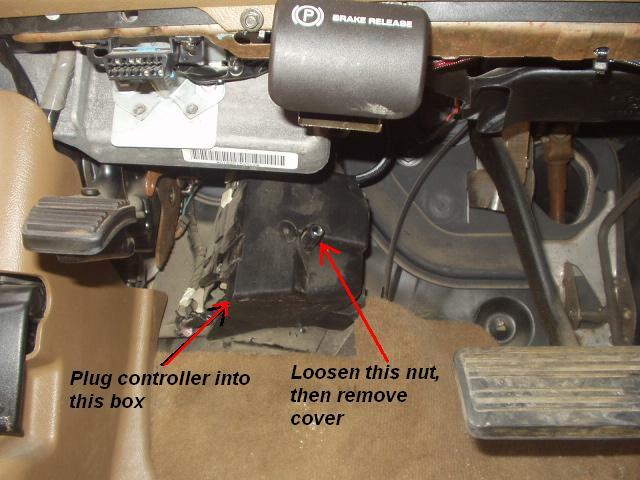 Otheriwise, getting to the Brake light switch is a hassle!